This morning I made Klippt kanellängd for breakfast. It is a Swedish pastry made with cinnamon, butter, milk, egg, sugar, salt, and cardamom. 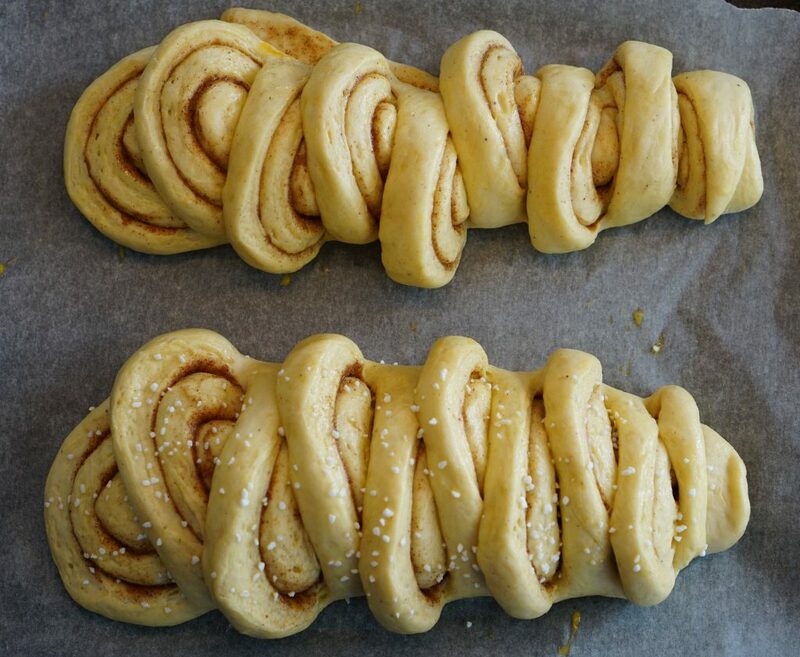 You roll it out, add a cinnamon filling, and roll it back up like you are making cinnamon rolls, except, you then take a pair of scissors, and cut the dough to make it’s signature design. It’s a really pretty bread. 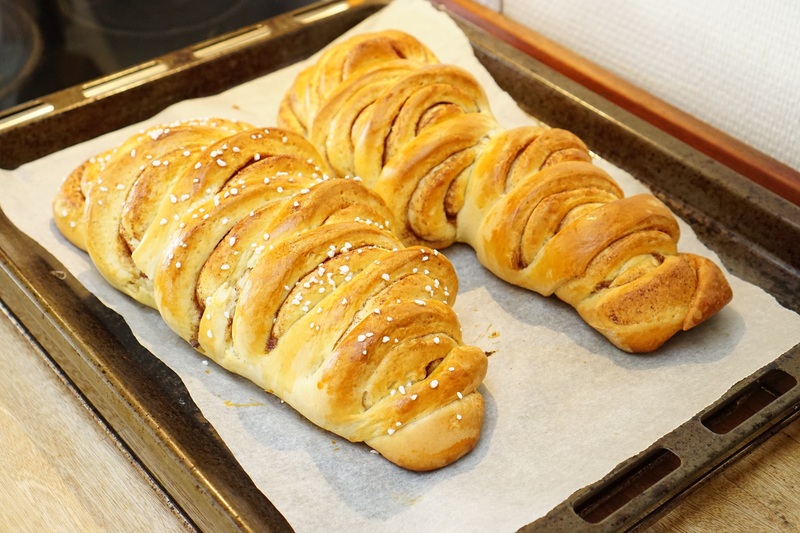 The name translates literally as long cut cinnamon….so I just renamed it to Swedish Cinnamon Bread hehe. There is a similar pastry in Denmark called Kanelstang (Cinnamon Stick) but the ingredients are a bit different, and there’s a sweet icing on top. I don’t mind sweet things, but I am just not a fan of this sweet icing found on top of several Danish pastries. It is way too sweet, it hurts hehe. Anyways I found this recipe on a Swedish website, and translated it below. I changed some of the steps, and doubled the filling recipe. So my version of this recipe is what is listed below. This was the first time I made this bread, and it turned out really pretty, and so good, but needed more filling, as the cinnamon sugar flavor was a bit too mild for me. For the topping I just sprinkled the top of one with a coarse sugar found in Sweden called pearl sugar, but you could put chopped almonds on top, or powdered sugar (after it’s baked) like the recipe suggests. I also made the dough the night before, and let it rise at room temperature, then put it in the fridge to rise over night. That way I could make this bread for breakfast the next morning. So when I woke up I took the dough out of the fridge to let it come to room temperature, then continued the recipe after a couple of hours. Dissolve yeast in a cup with lukewarm milk. In a separate large bowl, whisk the dry ingredients together - salt, cardamom, sugar, and flour. Then, add the butter, and mix with your hands until it resembles bread crumbs. Then, pour the milk/yeast mixture, and egg into the bowl with the dry ingredients, and mix together until a dough starts to form. Knead the dough on a clean surface dusted with flour until it is smooth, about 5 minutes. Cover the dough, and let it rise for 45 minutes. Roll out the dough in a rectangle shape, about ½ cm thick. Spread the butter, for the filling, on the dough with a knife, and sprinkle cinnamon and sugar on top. Roll each rectangle (like you are making cinnamon rolls) and place each rolled dough (with space between them) on a baking sheet lined with baking paper. Take a pair of kitchen scissors and cut the rolls (about 13 snips or centimeter-thick slices) along the middle of each roll, but not too deep. You want each piece to still be attached to the bottom, about 1 cm thick. Then, drag each piece you cut to the side - left side, then right side, and continue alternating, pulling them a bit apart so each piece is bent backwards. Brush each cinnamon pastry with beaten egg, and sprinkle with almonds (optional) or coarse sugar (optional). Cover it and let it rise for 30 minutes. Pre-heat the oven to 200 degrees C or 400 F.
Bake the pastries at the bottom of the oven for 25 - 30 minutes. Let them cool, and dust with powdered sugar before serving, if you like.